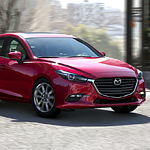 The new Mazda3 Sedan is that compact car that drivers are raving about this year, mostly because of the countless safety features making it easier to drive. When you are driving the all-new Mazda3 Sedan on the road and the vehicle slowly begins to drift from the safety of the lane lines, this is when the Lane-Keeping System is activated. Although the system is scanning the road surface to make certain your car is in between the lines, your steering wheel pulses if the line is crossed so you take action. In order to help bring your vehicle to a safer stop if the threat of a collision is imminent, your Mazda3 Sedan is equipped with a Pre-Collision Assist system. When the forward mounted sensors detect a threat of collision, the brakes will be pre-charged after the driver gets a visual warning to bring the car to a stop safely.